Alan Manly grew up on a small farm on the outskirts of Bacchus Marsh in the North West of Victoria. His family tried to make a living from the land, but his father was in poor health and the family struggled to survive. Alan attended the local state school, as did its most famous graduate, the Man Booker prize winner, Peter Carey. After dropping out in Year Nine Alan worked as a postman before securing an apprenticeship as a television repairman. Unfortunately, his employer went broke, was convicted of fraud and committed suicide. But the great apprenticeship system swung into action and Alan was offered a job as a computer engineer in Melbourne. After a stint in research and development he switched to sales and marketing and was hired by the Digital Equipment Corporation. After several years with Digital Alan became involved with a company which was developing its own software products and it was during this period of his career that he became embroiled in the legal nightmare which is the subject of this book. Since then Alan has successfully embarked on a new career in the education sector. He lives in Sydney with his wife and son. Have a genuine commitment to each other first and foremost. Relationships are fraught at the best of the times and withstanding shocks from external sources will rock that commitment. Be prepared and preferably have a long history of working through things together. Remain trusting and committed to staying by each other's side. During a time of high stress, it's important to provide a home environment in which there are some escape mechanisms from the day to day problems of the court battle. A weekend away, dinner with friends, quality family time and exercise are ways to keep your mind fresh and focused on what's important, and what you're ultimately fighting for. It's an unfortunate fact that no matter how you think you have protected yourself, anyone can be taken for a legal ride. It really can happen to you. If you both can understand this then you won't feel so victimised and have a better chance at keeping your relationship intact. You have to both believe you are right. During a court case there will be times of doubt as lawyers or your opposition try to prove their case – you must have 100% belief that you are in the right. Potentially no one else will. During any court battle there will no doubt be times of high stress. Just remember that your partner is by your side helping you through it. Make regular time to talk to each other about the case, your feelings, and any fears as they arise. Listen to each other and know that you're in this together. Question: Why did you decide to write about your experience in When There Are Too Many Lawyers, There Is No Justice? Alan Manly: During the ten years of the court battle that involved over thirty different court cases I was forced to totally focus on avoiding disaster in the court. I had to defend each and every case. The first few cases were defended using lawyers. But after four years of watching lawt=yers not really make any progress against our antagonise I decided that I would represent myself. The experience was all consuming. After the last case I was still reliving the bad experience to anyone prepared to listen. Perhaps a bit like a soldier returning from a war zone. Many people after listening to me relive the story would suggest that 'You should write a book". My wife thought that it would be cathartic. 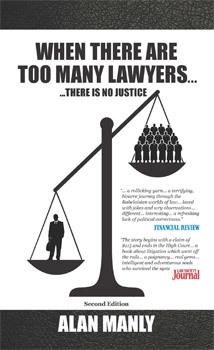 Hence I told my story in the book When There Are Too Many Lawyers… There Is No Justice. Question: Can you tell us a little bit about your story? Alan Manly: When I volunteered to be a Director of a not for profit industry body, I took comfort in the knowledge that I was protected by the 'corporate veil" and limited guarantee. I was to learn that limited guarantee was all very well until a vexatious litigant came along. A petty dispute about an invoice for $115 dragged on and on. Over 250 court appearances, 30 plus different court cases proceeding from the Local Court in North Sydney to the District Court, Supreme Court and finally in the High Court and victory was finally achieved. Question: What did you learn from your ten year experience? Alan Manly: If involved or tempered to get involved in the court system be aware that it is a self-perpetuating bureaucracy with the main advantage going to the operatives in the system being, lawyers. Question: Why was it important for you to be brutally honest in this recap? Question: Can you talk about the feedback you've had from the book? Alan Manly: Surprisingly supportive. No one has ever told me that they love lawyers or that I have been unfair. Often people tell me their horror story of a dispute that ended about the same time they or their opponent ran out of money. Commercial decision we are told. Seldom justice is claimed. Many people, maybe most, feel that the court system is not for their justice but there for lawyers.